Or: What to do with a few scraps of wood and a few hours of unexpected free time. When I designed my tool cabinet about 7 years ago, I carefully arranged sketches of my handtools on gridded paper. Well, needs change, priorities change, and minds change, so my half empty cabinet looks a bit different than the original design. When faced with a Sunday afternoon with nothing to do but weed the flower beds—a most egregious task—I decided instead to make a couple tool holders for my dovetail and tenon saws and my little mallet. The saw holders are simple—just a block of wood that matches the shape of the inside of the handles, and little turnbuttons to keep the saws from sliding off the blocks of wood. 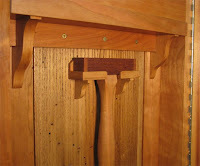 The mallet holder mimics the shelf that holds the chisel rack. Also pictured are two Mag-Bloks (which work extremely well) that I bought from Lie-Nielsen to hold gouges and floats. So after I made the tool holders, I looked around to see what other handtools needed to be hung in the cabinet. Shockingly, and to my utter dismay, I found that everything—everything!—already had a home in some compartment, drawer, or shelf. And we know what that means, don't we? Time to go tool shopping!